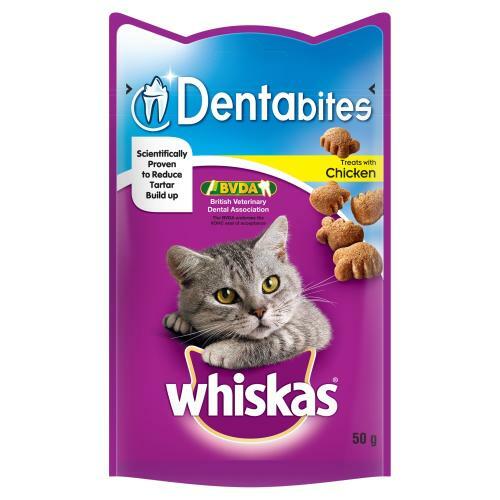 Whiskas Dentabites Cat treats look after your cat’s teeth. Made with soft centred juicy chicken or tasty salmon flavour and rich in vitamin C to keep gums healthy. Whiskas Dentabites are scientifically proven to reduce plaque, tartar, keep teeth strong and help freshen breath. Chicken: Cereals, Meat and Animal Derivatives (including 15% Chicken), Vegetable Protein Extracts, Derivatives of Vegetable Origin, Oils and Fats, Minerals, Yeasts, Seeds, Herbs. Salmon: Cereals, Meat and Animal Derivatives, Vegetable Protein Extracts, Derivatives of Vegetable Origin, Oils and Fats, Fish and Fish Derivatives (including 4% Salmon), Minerals, Yeasts, Seeds, Herbs. Chicken: Protein 26.2%, Fat Content 12.2%, Inorganic Matter 9.8%, Crude Fibres 5.2%, Moisture 10%, Energy 343 kcal/100g, Omega3 Fatty Acids 1868mg/kg. Salmon: Protein 28.1%, Fat Content 13.0%, Inorganic Matter 8.9%, Crude Fibres 5.2%, Moisture 8.8%, Energy 354 kcal/100g, Omega3 Fatty Acids 1868mg/kg. Chicken: Cupric Sulphate Pentahydrate 3.2mg, Potassium Iodide 0.27mg, Zinc Sulphate Monohydrate 0.01mg. Salmon: Cupric Sulphate Pentahydrate 3.2mg, Potassium Iodide 0.27mg, Zinc Sulphate Monohydrate 0.01mg.